Noah Grant married Martha Huntington, daughter of (?) Huntington and Abigail Lathrop. Noah Grant was born on 11 December 1693. He was the son of Samuel Grant Jr. and Grace Miner. Noah Grant died on 10 October 1727 at age 33. Married Name Her married name was Grant. Martha Huntington married Noah Grant, son of Samuel Grant Jr. and Grace Miner. Martha Huntington was born on 6 December 1696. She was the daughter of (?) Huntington and Abigail Lathrop. Martha Huntington died on 26 August 1779 at age 82. Captain Noah Grant Jr. was born on 12 July 1719. He was the son of Noah Grant and Martha Huntington. Captain Noah Grant Jr. married Susannah Delano, daughter of Jonathon Delano Jr. and Amy Hatch, on 5 November 1746. Captain Noah Grant Jr. died in 1756. Married Name 5 November 1746 As of 5 November 1746,her married name was Grant. Susannah Delano was born on 23 June 1724. She was the daughter of Jonathon Delano Jr. and Amy Hatch. Susannah Delano married Captain Noah Grant Jr., son of Noah Grant and Martha Huntington, on 5 November 1746. Susannah Delano died on 16 August 1806 at age 82. Child of Susannah Delano and Captain Noah Grant Jr.
Married Name Her married name was Delano. Amy Hatch married Jonathon Delano Jr., son of Jonathan Delano and Mercy Warren. Amy Hatch was born in 1687. She was the daughter of Joseph Hatch and Amy Allen. Amy Hatch died in 1762. Children of Amy Hatch and Jonathon Delano Jr.
Captain Noah Grant III was born on 20 June 1748. He was the son of Captain Noah Grant Jr. and Susannah Delano. Captain Noah Grant III married Rachel Kelly on 4 March 1792. Captain Noah Grant III died on 14 February 1819 at age 70. Married Name 4 March 1792 As of 4 March 1792,her married name was Grant. Rachel Kelly was born circa 1772. She married Captain Noah Grant III, son of Captain Noah Grant Jr. and Susannah Delano, on 4 March 1792. Rachel Kelly died on 10 April 1805. Jesse Root Grant was born on 23 January 1794. He was the son of Captain Noah Grant III and Rachel Kelly. Jesse Root Grant married Hannah Simpson, daughter of (?) Simpson and Rebecca Weir, on 24 June 1820. Jesse Root Grant died on 29 June 1873 at age 79. Married Name 24 June 1820 As of 24 June 1820,her married name was Grant. Hannah Simpson was born on 23 November 1798. She was the daughter of (?) Simpson and Rebecca Weir. Hannah Simpson married Jesse Root Grant, son of Captain Noah Grant III and Rachel Kelly, on 24 June 1820. Hannah Simpson died on 11 May 1883 at age 84. President Ulysses Simpson Grant was born on 27 April 1822. He was the son of Jesse Root Grant and Hannah Simpson. President Ulysses Simpson Grant married Julia Boggs Dent, daughter of Colonel Frederick Dent and Ellen Bray Wrenshall, on 22 August 1848. 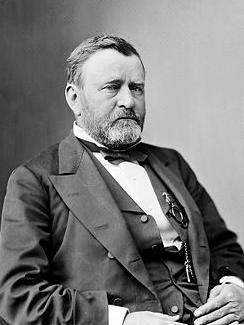 President Ulysses Simpson Grant died on 23 July 1885 at age 63. Ulysses S. Grant (born Hiram Ulysses Grant) (April 27, 1822 – July 23, 1885) served as the 18th President of the United States from 1869 to 1877. As general-in-chief of the Union Army during the American Civil War, he led the North to victory against the Confederate States in the Civil War. Following his graduation from the United States Military Academy in 1843, Grant served as a lieutenant in the Mexican–American War from 1846 to 1848. After he had resigned from the army in 1854, he struggled to make a living and worked as a real estate agent, laborer and county engineer. In 1861, he joined the Northern effort in the Civil War. Rapidly earning a reputation as one of the North's most aggressive generals Grant rose quickly through the ranks. He was appointed lieutenant general by President Abraham Lincoln in 1864. He implemented a strategy of simultaneous attacks aimed at destroying the South's military and its economy. In 1865, after mounting a successful war of attrition against the Confederacy, he accepted the surrender of Confederate General Robert E. Lee at Appomattox Court House. Married Name 22 August 1848 As of 22 August 1848,her married name was Grant. Julia Boggs Dent was the daughter of Colonel Frederick Dent and Ellen Bray Wrenshall. Julia Boggs Dent married President Ulysses Simpson Grant, son of Jesse Root Grant and Hannah Simpson, on 22 August 1848. Colonel Frederick Dent married Ellen Bray Wrenshall. Married Name Her married name was Dent. Ellen Bray Wrenshall married Colonel Frederick Dent. John Miner was born in 1635. He was the son of Thomas Miner. John Miner died in 1719. Thomas Miner was born in 1608. He was the son of Clement Miner. Thomas Miner died in 1690. Clement Miner was born in 1585. Married Name Her married name was Simpson. Rebecca Weir married (?) Simpson. Rebecca Weir was born in 1770. She was the daughter of Samuel Weir. Rebecca Weir died in 1801. (?) Simpson married Rebecca Weir, daughter of Samuel Weir. Samuel Weir was born in 1731. He was the son of John Weir. Samuel Weir died in 1811. John Weir was born in 1700. Hugh Weir was born in 1725. Hugh Weir died in 1779. Jonathan Weir was born in 1750. He was the son of Hugh Weir. Jonathan Weir died in 1832. James Hutchenson Weir was born in 1789. He was the son of Jonathan Weir. James Hutchenson Weir died in 1832. Married Name Her married name was Huntington. Abigail Lathrop married (?) Huntington. Abigail Lathrop was born in 1665. She was the daughter of (?) Lathrop and Elizabeth Scudder. Abigail Lathrop died in 1745. (?) Huntington married Abigail Lathrop, daughter of (?) Lathrop and Elizabeth Scudder. Married Name Her married name was Lathrop. Elizabeth Scudder married (?) Lathrop. Elizabeth Scudder was born in 1622. She was the daughter of (?) Scudder and Elizabeth Stoughton. Elizabeth Scudder died in 1700. (?) Lathrop married Elizabeth Scudder, daughter of (?) Scudder and Elizabeth Stoughton. Married Name Her married name was Chamberlain. Married Name Her married name was Scudder. Elizabeth Stoughton married (?) Scudder. Elizabeth Stoughton married (?) Chamberlain. Elizabeth Stoughton was born in 1600. (?) Scudder married Elizabeth Stoughton. Married Name Her married name was Betts. Joanna Chamberlain married (?) Betts. Joanna Chamberlain was born in 1620. She was the daughter of (?) Chamberlain and Elizabeth Stoughton. Joanna Chamberlain died in 1711.